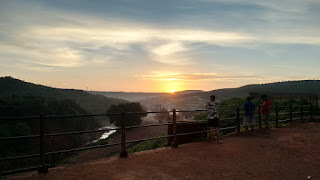 I woke up just before sunrise to find the others already awake, taking photos. The view was breathtaking - the rising sun on one side, the serene lake on the other. 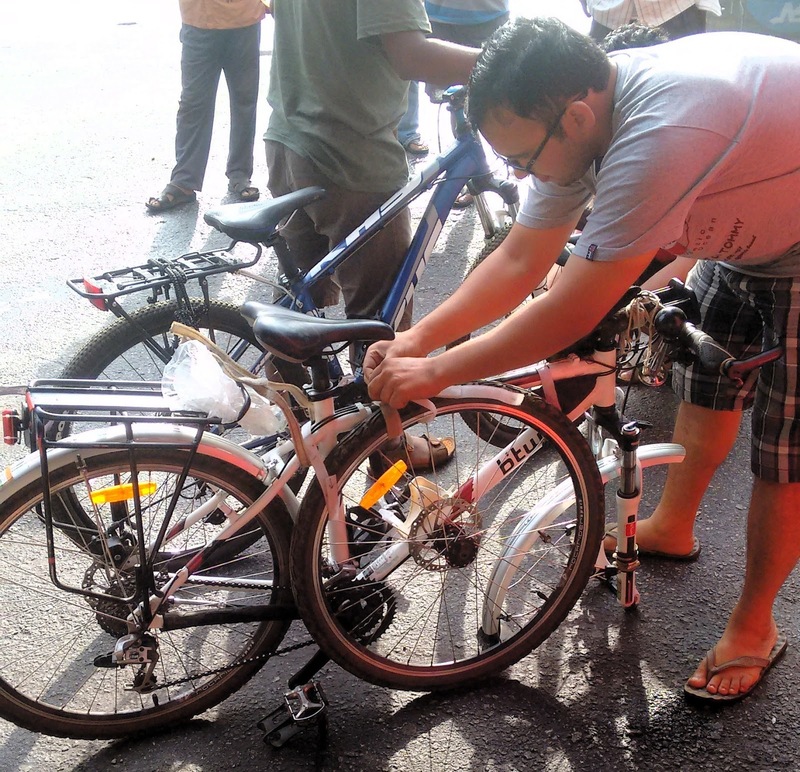 We quickly packed the tents and our gear, and had some Idli, Vada Pav and tea for breakfast. 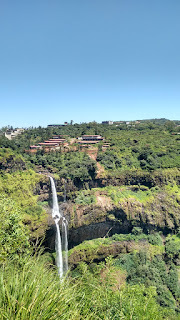 We had decided to ride down via Medha to Satara, stopping to see Chinaman and Lingmala waterfalls on the way. Chinaman Falls was a little hard to find, we actually had to leave the bikes and hike fair bit off the main road. 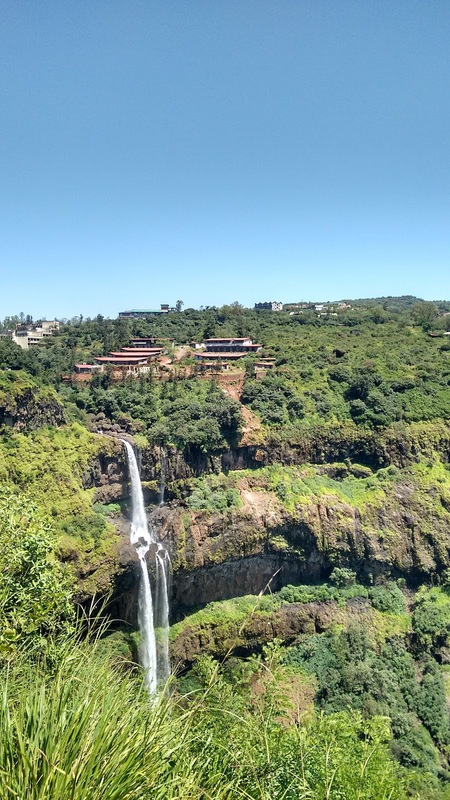 Lingmala is a more mainstream tourist place, with paved and fenced paths to the view point, and was correspondingly more crowded. Upstream of the falls there is a small natural pool where one may swim, wade or just chill out. 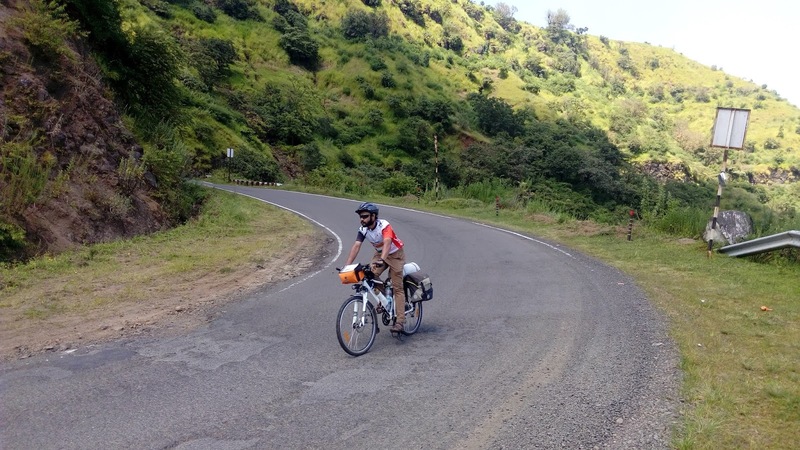 (Note to self: Pune - Lingamala - Pune would make a great 1-day 200k ride). 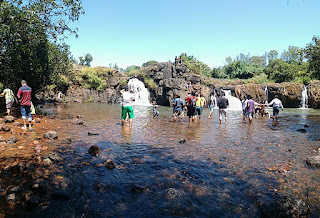 Natural pool formed by the Venna river, upstream of Lingamala waterfall. From here on the road was all downhill, with lots of sharp bends and blind turns. I was carrying a fair bit of load and didn't want the brakes overheating, so I resisted the temptation to zip downhill. We had ample time so we stopped for a relaxed dip in the Venna river. 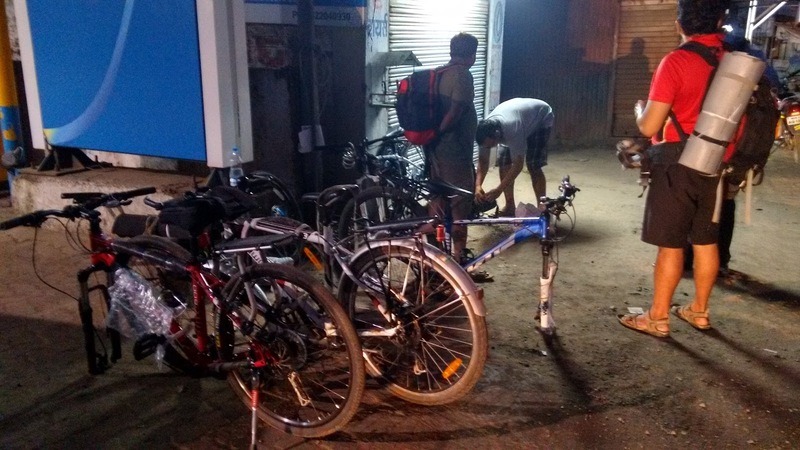 We reached Satara with lots of time to spare, and this time kept the bikes ready for loading. 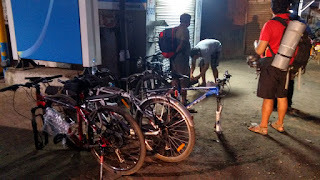 We were worried that the bus might show up with the luggage bay full (most operators carry cargo for hire), but luckily there was enough room for all four bikes. Our experience with VRL, however, was less than ideal. and the downtube must have fallen off somewhere. On the whole it was an awesome tour, thanks to some dedicated planning and research by Rafi. Vidyasagar and Gautham provided great company and rode very well despite being relatively new to cyling. 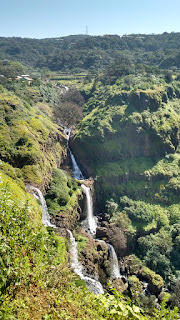 A slightly longer tour - perhaps three or four days - would be required to better explore all of Mahabaleshwar and Koyna. 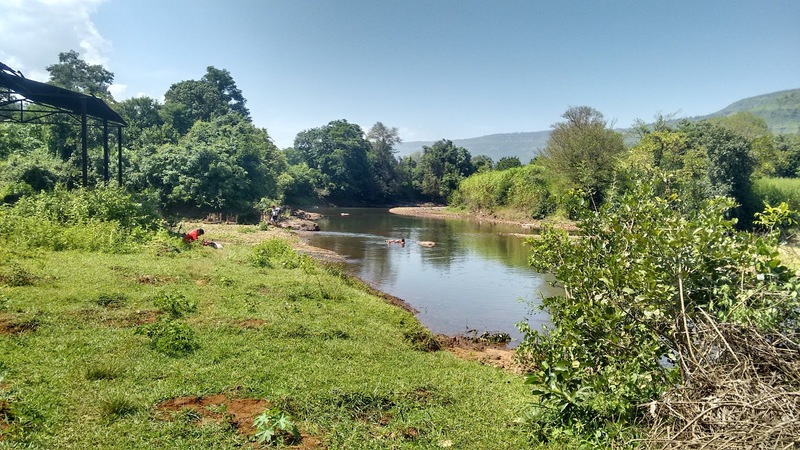 September is a good time to visit the area when the rains have ended, but can be a little crowded since Kaas is also in bloom at this time. Late February - strawberry season - is also a great time to visit. Summers are best avoided. Simple and crisp details. 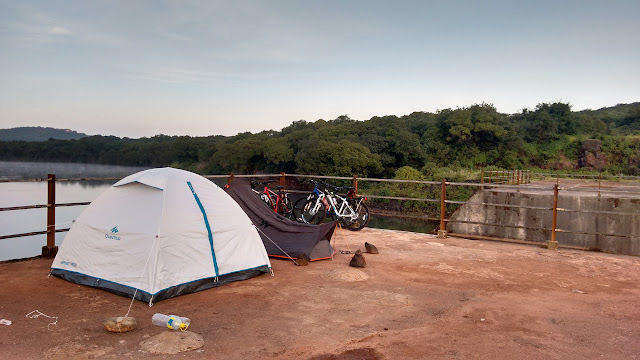 Thanks for bike packing tips, the best and safest way :). Hope to ride you with you again soon.